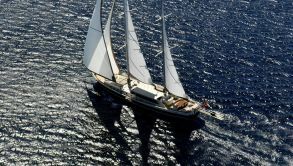 in order to consider a Gulet in the Category of luxury crewed gulet charter we make sure that the yacht is built with with Lloyd’s or rina class certificates so that she can be registered for commercial crewed luxury gulet charter yacht. the captain and the crew to serve the guests must be professionals who are going to treat the guests as the owner of the yacht from the moment they step in aboard. mostly there are 6 or 7 crew members to accomodate and keep up the high standards which the guests would be expecting on board. Turkish luxury gulet charter yachts are very popular for their size and spacious accomodations which can be found in megayachts only and the modern amenities , water toys as well as the galley are upto highest standards and the chefs are capable of preparing any dish from world cuisine and the crew can serve with utmost attention. our company takes pride in serving the highest quality luxury gulet charter and motoryachts with proven capabilities known to our industry.